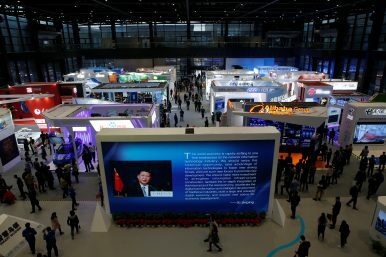 China's President Xi Jinping shown on a screen in front of logos of China's leading Internet companies during the third annual World Internet Conference in Wuzhen, Zhejiang province, China (November 17, 2016). Mirjam Meissner and Jost Wuebbeke are heads of the Economy & Technology program at MERICS. Mrs. Meissner’s research focuses on industrial and infrastructure policy as well as renewable energy in China. Mr. Wuebbeke specializes in China’s innovation policy, digital economy, energy policy and product safety.